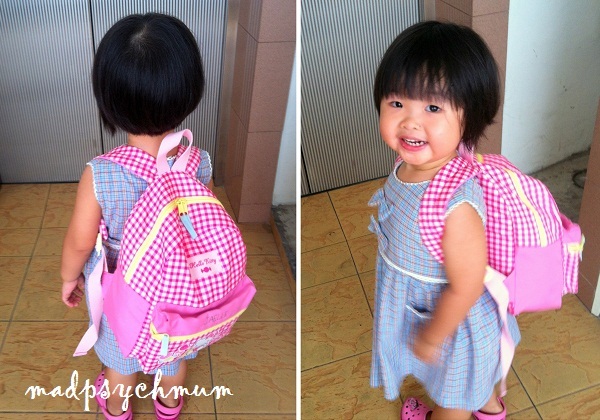 It's the day I wasn't all too excited about after the year turned 2013, my girl's first day at school alone! And when I say "day", I really meant week as it was a long and heartbreaking process.. It turned out that when all the other children were wailing their lungs out, it scared my girl so much that she started sobbing too. Her grandmother stayed with her for as long as she could and went home only during nap time after my girl has fallen asleep, exhausted from all the crying. When she returned 2 hours later, my girl had stopped crying and was so excited to go home! I thought, "Well, that's that. Hopefully it will be better from now on." I was wrong of course. Since she will be going to child care this year, we switched her weekday classes at the preschool that she has been attending twice a week for almost half a year to weekend instead. This is an independent class so parents were not allowed to be present. I told her frankly that I was going to leave her there with the teacher, stay outside and then come back only after the class. Initially she had no response but then when it slowly dawned on her that she was going to be alone in the room, she started sobbing hysterically. I shook my head firmly, left the room and prayed that she will stop! My mum-in-law called me and was literally in tears as she describe how she left my girl there and she started bawling her eyes out until it was red and swollen. She couldn't bear it and finally took our advice to go home. I finally decided to seek my supervisor's permission to work from home the following day as I feel I will do a better job of easing her in. I'm working from home today so that I can send my girl to school personally and check in on her every 3 hours to make sure that she is ok. When she saw me in my shorts and T-shirt, she said, "Are we going gai gai (shopping)?" because that's how I dress during the weekends. I replied, "No. Mummy is bringing you to school today." 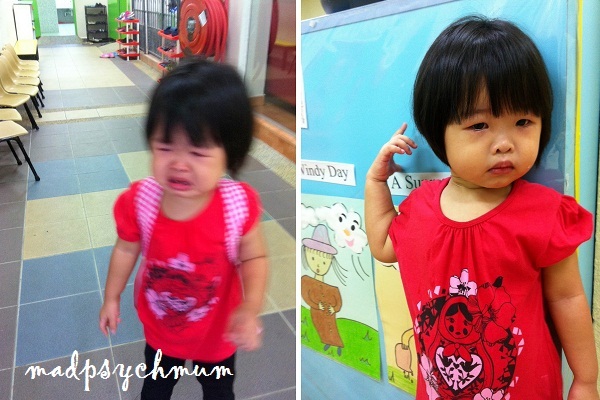 When we bade goodbye to her grandmother at the road, she thought we were going to her usual preschool. But when I informed her that I was taking her to her child care just across the road, she became very silent. The moment we walked through the gates of the CC, she immediately started crying. I was firm with her as usual, telling her to remove her shoes and show me when she puts her bag. She stopped crying for a while when she saw that I entered the CC with her but started tearing up again when I said I was going to leave soon. Finally I said to her, "Alright, last hug and last kiss. See you later, bye!" She burst into tears but managed to give me a weak wave as I walked out. When I returned during lunch to check on her, she had stopped crying already and was actually laughing with her friends. It was the same routine: Tell her it's time for school, silence on the way there, crying at separation but was able to let go and wave goodbye. On the bright side, crying at separation is actually good from a psychology perspective as it means she has developed a strong bond to her caregivers. I suppose I will miss this clingy-ness one day when she tells me she doesn't need me anymore. Sigh.. The dilemma of motherhood.